Kazakhstan, officially the Republic of Kazakhstan, is a transcontinental country in northern Central Asia and Eastern Europe. Kazakhstan is the world’s largest landlocked country, and the ninth largest in the world, with an area of 2,724,900 square kilometres (1,052,100 sq mi). Kazakhstan is the dominant nation of Central Asia economically, generating 60% of the region’s GDP, primarily through its oil/gas industry. It also has vast mineral resources. Kazakhstan is officially a democratic, secular, unitary, constitutional republic with a diverse cultural heritage. Kazakhstan shares borders with Russia, China, Kyrgyzstan, Uzbekistan, and Turkmenistan, and also adjoins a large part of the Caspian Sea. 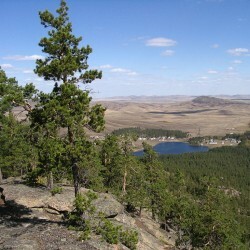 The terrain of Kazakhstan includes flatlands, steppe, taiga, rock canyons, hills, deltas, snow-capped mountains, and deserts. Kazakhstan has an estimated 18 million people as of 2014. Given its large land area, its population density is among the lowest, at less than 6 people per square kilometre (15 people per sq. mi.). 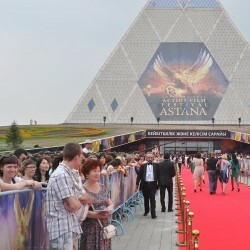 The capital is Astana, where it was moved in 1997 from Almaty, the country’s largest city. Kazakhstan was the last of the Soviet republics to declare independence following the dissolution of the Soviet Union in 1991. The current President, Nursultan Nazarbayev, has been leader of the country since then, and is characterised as authoritarian, with a government history of human rights abuses and suppression of political opposition. 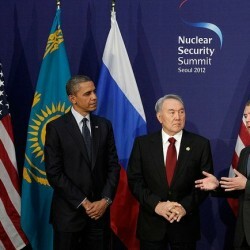 Kazakhstan has worked to develop its economy, especially its dominant hydrocarbon industry. 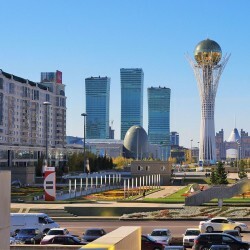 Human Rights Watch says that “Kazakhstan heavily restricts freedom of assembly, speech, and religion,” and other human rights organisations regularly describe Kazakhstan’s human rights situation as poor. 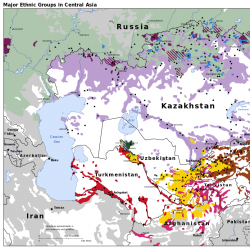 Kazakhstan’s 131 ethnicities include Kazakhs (63% of the population), Russians, Uzbeks, Ukrainians, Germans, Tatars, and Uyghurs. Islam is the religion of about 70% of the population, with Christianity practised by 26%; Kazakhstan officially allows freedom of religion, but religious leaders who oppose the government are suppressed. The Kazakh language is the state language, and Russian has equal official status for all levels of administrative and institutional purposes. 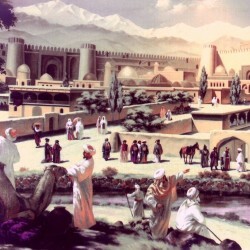 Short brief about the History of Kazakhstan.